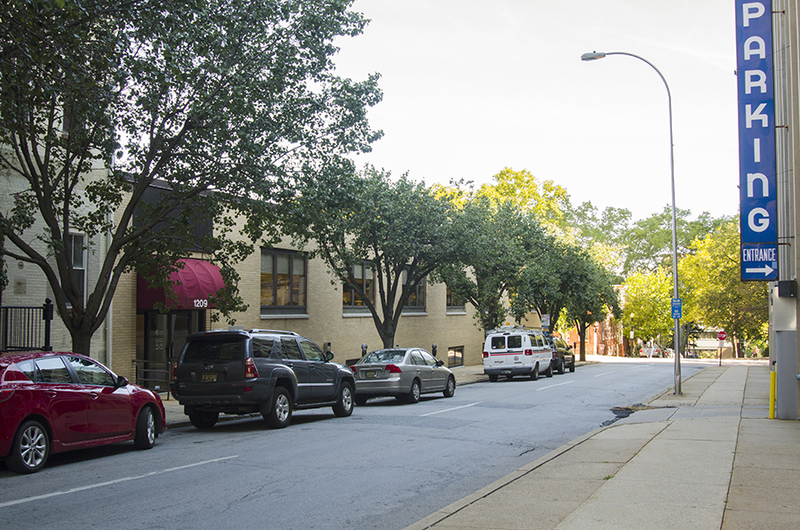 As an international locus of financial activity, the downtown and central business district of Wilmington, Delaware consists of little more than a few quiet streets lined with trees and generic office buildings. Not towers so much, just buildings, lacking anything significant enough to create a memory. On one of said blocks, just north of the Delaware State Chamber of Commerce, sits a nondescript, two-story beige brick building. 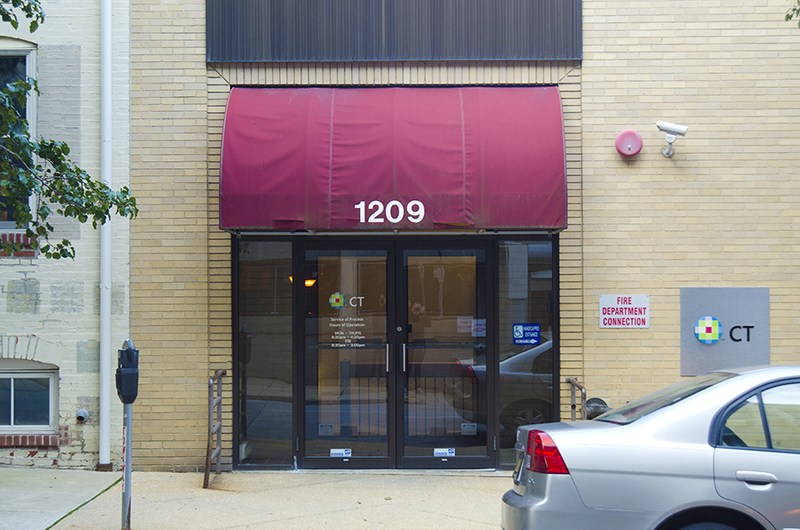 The only mark of distinction on its façade is a dark red awning with “1209” printed in white Helvetica.1 On the glass door (locked, guarded with video surveillance) is the geometric logo for CT (the Corporation Trust Company), the spiritual center of corporate America, one of Delaware’s most prominent registered agent companies, wholly owned by the Dutch business administration corporation Wolters Kluwer. The main entrance to 1209 Orange Street, Wilmington, Delaware. Image courtesy of the author. Due to the sheer number of businesses claiming 1209 Orange as their incorporation address, critics have deemed it “the biggest building in the world.” Image courtesy of the author. The most striking feature of the interior is its lack of access. For the lay visitor, there is little more than a waiting room enclosed in glass storefront to welcome you into the heart of corporate America. The waiting room consists of one black leather chair, a plant (perhaps fake, maybe real, definitely waxy and oddly colored), and a small table on which sits nothing. Aluminum mini-blinds are drawn over the waiting room interior although a drop ceiling, defining the office as a no-nonsense domain of secretarial work, can easily be spotted through them. There is a receptionist, also sitting behind a half-drawn window. Ostensibly, the receptionist directs phone calls and controls access to the tightly guarded offices, and when asked if it’s possible to take a look at the offices, noting that I am interested in some of their services, she politely, even if annoyed, offers to take my name and get back to me. She never does. The netherworld of the Phantom Tollbooth Plaza., juridically formed for more than a century to submissively serve the needs of American Business (and now, of course, Global Business). To claim Delaware’s role in contemporary business as anything other than standard would belie an ignorance and naïveté about the basic functions of American business. According to Delaware’s Division of Corporations, the reason more then half of the Fortune 500 corporations choose to headquarter in the state is due to its “advanced and flexible statues…the Delaware courts…and the state legislature.” In addition, “The people of Delaware are aware that the income received from corporation franchise taxes is an important part of the state budget and that Delaware law firms that specialize in business and law matters employ significant numbers of people.”4 To put it another way, the laws and statutes of Delaware have been specifically designed, and are rigorously defended, to lighten the tax burden on registered companies while levying a very minor yearly incorporation fee that, when aggregated, largely funds the state’s budget. Architecture and the 'Creative Economy.'2. Which Public? Conflict as catalyst. —are duly noted. The competition between states, nations, and other geopolitical designations to attract business is often called the “race to the bottom,” wherein states, cities, “special economic zones,” and entire nations deregulate their economies and lower taxes—in some cases removing them altogether—in an effort to attract international finance, global trade, and the local jobs they require. The classic example is offshore manufacturing, in which global companies move production from state to state following the path of least regulation and lowest labor costs. The race to the bottom is simply another name for globalization, which is another name for Business As Usual. The race to the bottom is little more than The Way Things Are Done, and should a corporation choose not to participate, CEOs would certainly be ousted by shareholders irate that every exploitable (and legal) means to financial profit hadn’t been exercised. The race, as it were, operates by a first-come logic, wooing corporations to a given jurisdiction with friendly laws and promises of secrecy, beckoning them to establish ties, thereby further confirming a given location’s status as business-friendly. The feedback thus begins. Since Delaware’s ascendance as the prime locale for business a century ago, it has been finely tuning its laws and court structure to consolidate its status at the top (or, bottom, if you will). The feedback loop has thus solidified into a stand-alone industry, creating a micro-economy of its own. In Delaware’s case, the micro-economy created by registration fees and minimal taxes has subsumed the state’s other industries and tax structures, creating a state economy wholly dedicated to servicing corporations. The policies directed specifically at luring out-of-state businesses to register in Delaware include no corporate income tax on companies doing business outside the state and no personal income tax on nonresidents. In addition, shareholders and directors are allowed to reside outside the state, and those shares owned by said shareholders are not subject to state taxes.11 In short, registering a business first in Delaware allows you to avoid all corporate income taxes and all personal income taxes associated with that business, either through straight profits or shares, without the inconvenience of having to actually live there. In an odd inverse, incorporating in Delaware does not allow a company to park assets—much as other infamous tax havens do—it allows the entire business to exist in a shadow location, thus freeing up assets to move to other destinations, often known for their financial secrecy and pristine beaches. The Supreme Court and Mitt Romney have been diligent in reminding us that corporations are people, and Delaware has been strategic in setting up an environment that allows the corporation to decouple itself from the (real) people who actually run it. In doing so, offices such as 1209 Orange Street function as little more than corporate dormitories, with hundreds of thousands of businesses residing in row after row of neatly organized filing cabinets. It turns out, it is shockingly easy to start a company in Delaware. The stack of papers with all the nefarious details in four-point type simply doesn’t exist. Same for the dense web of complicated documents and forms-to-be-signed written in dense legalese. The whole thing can be done with a couple of emails and one afternoon. 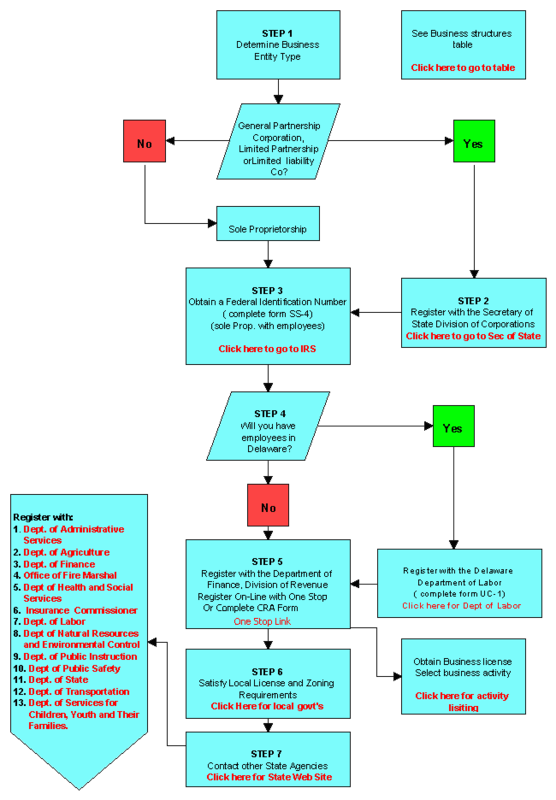 Incorporation flowchart summarizing the process of registering a business in the State of Delaware. Image from the Delaware State Division of Corporations website. By far the easiest way to start your Delaware-based company is to skip the (admittedly short) list of steps provided by the state and go right to the registered agent, which is exactly what I did. The registered agent is the function that allows Delaware to host so many national corporations. It is the industry and the financial engine that keeps the whole machine well-oiled. The agent is, in effect, your proxy presence within the state. They handle all paperwork transactions, receive legal documents, communicate on your behalf, notify you of all annual filings and tax responsibilities, and most importantly, provide an address for your entity to call home. They are your Guy in Delaware; the sad souls suffering in Wilmington so the rest of us can luxuriate in Manhattan and Mountain View. The Corporation Trust Company operates several different websites, ostensibly targeted to different audiences, but funneling you toward the same essential incorporation services. One phone call got me connected directly to Mary Bastian. Mary was interested in very little aside from getting me signed up and off the phone. She was patient, but like the nameless receptionist from my in-person visit, had little time for inquisitive questions on the nature of incorporating and what Delaware means in a more global, metaphysical sense. It was clear I was not a major corporation or large business entity; I wasn’t going call upon them to deploy their vast knowledge of tax and business experience. I was just another schmuck looking to avoid a couple of dollars of tax liability. Mary immediately sent me a preformatted email informing me CT they will be pleased to act as my agent. It also mentioned that CT serviced more than 2.1 million documents last year (8,077 per day! ), and by that statistic alone, it is very clear why she had little interest in entertaining my questions. To finalize the transaction all I need to do is fill out a Certificate of Formation from the state and a Representation Questionnaire from CT noting that the only really important information was my company’s name and my credit card info so CT can administer a yearly fee of $362 and my filing charges ($90 for articles of incorporation, $50 to receive certified copies of all paperwork, a one-time $197 filing fee, and a $15 computer access fee). On the Division of Corporations website the State of Delaware provides a simple chart, neatly comparing various business structures and noting their tax and legal liabilities. As a single-employee business (at least at this point), and wanting to separate the company from my personal finance (thus limiting my personal liability), Mary and I decided the Limited Liability Company was the best option. From here on out, as an LLC, my only obligation toward the state of Delaware is a $250 yearly tax, to be paid by March 1 of every year—and, of course, my yearly $362 obligation to CT, which you will note is exactly $112 more than the fee to the state. The only official document required by the state is a text file with three questions: What is the name of my business; the address—filled out by Mary with the notorious 1209 Orange Street address; and whether or not there is a specific date to dissolve the entity. In this case, I chose December 31, 2014, as my dissolution date after being told that sometimes businesses dissolve after only a few days, which of course brought Mary a bunch of irritating questions, none of which she answered. I submitted my paperwork, complete with typed signature, on the afternoon of March 27, 2014. 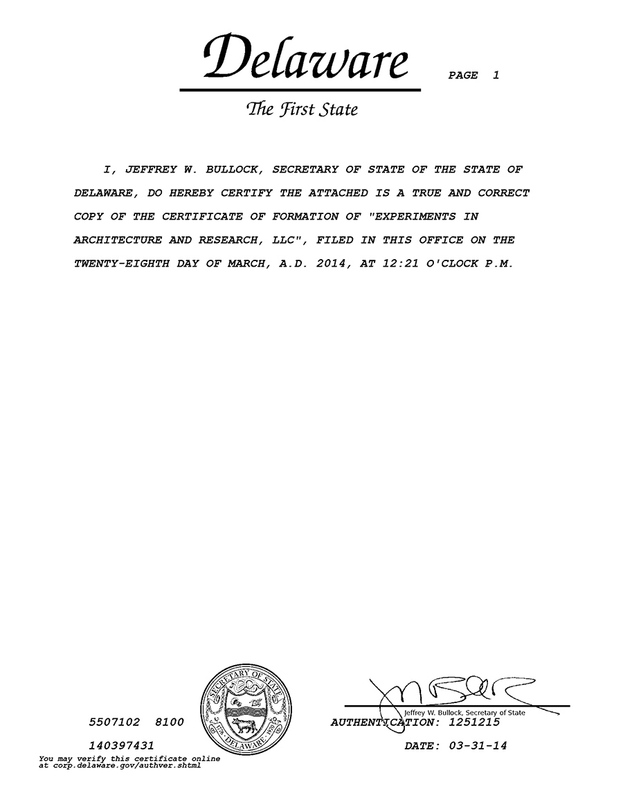 This simple form is the only official document required by the State of Delaware to register a business. It can be downloaded from the State website, although this one was filled out by CT on my behalf. Image courtesy of the author. Aside from the name and address I sent to CT, there was no actual identification required of me by the state, a fact many critics have noted. There is no way for the state to know who or what is being incorporated, no due diligence on assets, and indeed no knowledge of what type of business my business is in. For all the State of Delaware knows, I am simply a business of some sort and an electronic signature. By the following Monday, Mary sent me one final email, which contained my official papers from Jeffrey Bullock, secretary of state of the State of Delaware, certifying the formation of my newly minted business. And with that, my relationship with Mary had come to a close, neatly tucked away within a filing cabinet, basking under the harsh fluorescent lighting of any office, USA. According to an investigative report by the New York Times, my new entity is essentially a shell company—one “with no employees, no assets and, in fact, no real business to speak of.” And along with dilettantes and hucksters like Jack Abramoff, the disgraced Washington lobbyist, and Russian arms dealer Viktor “the Merchant of Death” Bout, I can now proudly claim Delaware as the home of my corporate heart. And with that, I have become one small part of the delicately formed and infinitely complex American financial structure, foundational to the global economy, and thoroughly lubricated with corporate dreams and firm handshakes. 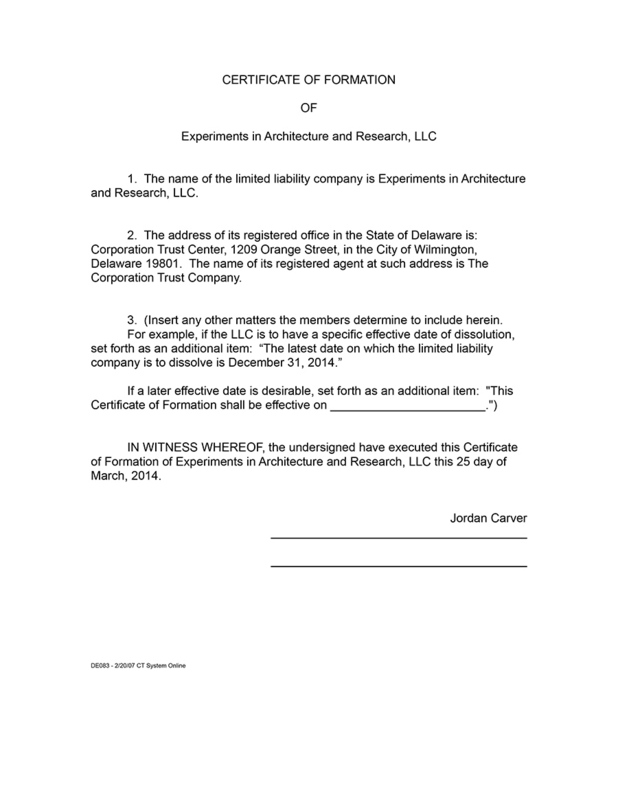 This document from the State of Delaware notes that as of 12:21 p.m. on March 28, 2014, Experiments in Architecture and Research is a legitimate Delaware-based Limited Liability Company. Image courtesy of the author. Jordan Carver is a writer, researcher, and educator in New York City where he is an Adjunct Assistant Professor of Architecture at Columbia GSAPP and the Managing Editor at GSAPP Books. His research practice is concerned with the spaces created where law, economics, and political rhetoric intersect.